If you want to lay your own turf, we recommend the following steps to ensure the best possible results. Use the links below to follow our tips step by step. 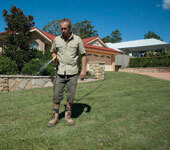 Good site preparation is the foundation to any successful lawn establishment. This needs to be followed with the turf laid in the correct pattern to give minimal joins. and then watered immediately to ensure the success of your new lawn. Lay turf in a brick pattern as shown in this diagram. Start with the outer edges making a border, then lay the remainder of the turf in a brick pattern making sure all joints (sides and ends) are butted together tightly without overlapping. Water installed turf as you go, starting 15 minutes after you lay the first slab. After you have installed all the turf, use your roller to smooth out any footprints or air pockets to ensure the turf makes good contact with the soil. If it is an extremely hot day, try to keep turf cool prior to installing and always install on the day of delivery. 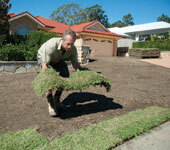 Order your turf for the day you plant to install it. Ensure you have the necessary tools to complete your installation. You will need a cutting spade (or a large knife), a roller, hose, wheelbarrow and rake. 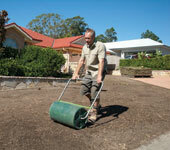 Obtain a good turf starter fertiliser, as this is a must for successful turf establishment. We have our own fertiliser available, which we will happily add to your turf order. Spread fertiliser on prepared soil using a hand held fertiliser spreader to ensure even coverage.